Is Delta One Better On The 757 Than The 767? Delta operates five aircraft types with lie-flat “Delta One” business class seats, and all five offer a unique seating experience. I remain firmly of the opinion that the seating style used on Airbus A330 aircraft is the best in the fleet, even after the introduction of the highly anticipated Delta One suites. The seats on the Boeing 767 — staggered side to side — aren’t as spacious or private, but they are a darn nice way to fly. Until my recent transcontinental flight from New York Kennedy to Seattle (SEA), I’d never flown on Delta’s smallest lie-flat aircraft, the Boeing 757. I’ve been a Delta frequent flyer for years, and part of my tardiness to this review is because of a reluctance to seek out the 757 on long distance flights. In economy (unlike its cousin 767) seats are narrow. In Delta One, the seats are situated two-by-two, meaning they don’t offer direct aisle access. Seats used on the 757 are an off the shelf seating product. The Rockwell Collins B/E Diamond business class seat is one of the most common in the world, used by everyone from Air China to American Airlines to Aeromexico to United. 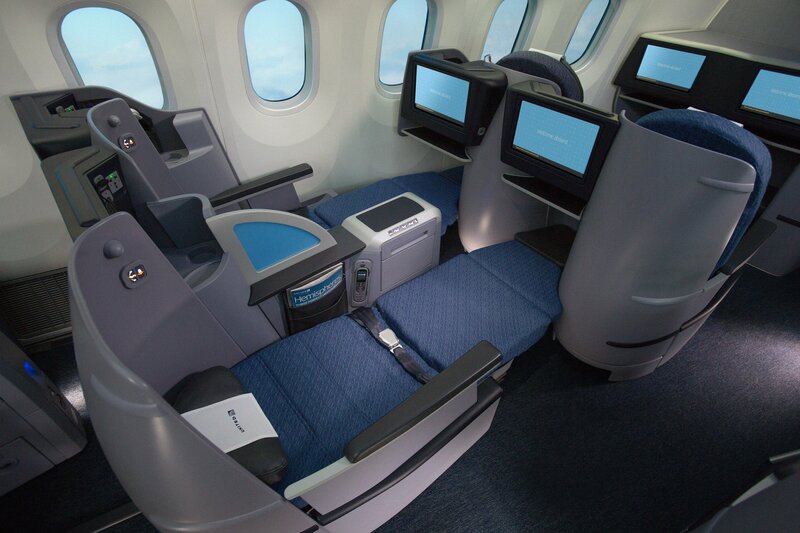 The B/E Diamond business class seat deployed here on a United 787 Dreamliner. After spending six hours in this cabin, though, I’ve rethought my past reticence. Delta has marvelously configured its Delta One cabin on the narrow 757, and the seats afford spaciousness and privacy that others in the fleet do not. Delta One on the 757 can be an excellent use of built up or bonus credit card points, at 50,000 SkyMiles for a 6.5-hour transcontinental haul like the one I was on. Find an aircraft that’s operating a route designated as “first class,” and you can score this lie-flat for as few as 35,000 miles each way. The highest signup bonuses we’ve seen on the Platinum Delta SkyMiles Credit Card from American Express cover a round-trip at that price. Points from cards like The Platinum Card (American Express), Gold Card (American Express) and Amex EveryDay Card can also be moved directly to Delta. For Chase Ultimate Rewards and Citi ThankYou cardholders, Delta One seats can be booked using Air France-KLM Flying Blue, but finding seats open through that program can be a challenge, and may warrant an award expert like Points Pros or Juicy Miles. Upshot – Pick This Aircraft! Delta’s Boeing 757 Delta One cabin has room for 16 in a private setting. With 16 seats, the Boeing 757 features the smallest business class cabin in the fleet. Boarding on 757s is always accomplished through the second door, meaning that Delta One customers are discretely welcomed to turn left, through a closed bulkhead, and into a very intimate cabin environment. With two flight attendants assigned to 16 passengers, service was swift. Overhead bins were also abundantly available, and I did not have to wait once for the lavatory (there’s one on each end of the cabin). At cruise, this cabin is whisper quiet. The 757s engines are far arear, and most of the ambient noise was wind. In this respect, the 757 feels like a much larger jet. The B/E Diamond seats are loved by airlines for some reasons. These off-the-shelf seats are relatively affordable, can be installed on virtually any aircraft and lie completely flat in bed mode. Continental Airlines debuted these seats in the United States in the late 2000s, so this is by no means a state-of-the-art seating design. Like an old MacBook, they still work exceptionally well. Airlines do make small design tweaks, and Delta’s Diamond seats are slightly taller than those used over at United. This accomplishes a few things. Footwells are taller and feel somewhat less restrictive, and the privacy dividers and drink tables are made larger, as they overhang the sleeping area. The foot wells on Delta’s 757 business class seat is sufficient for my size 13s. These seats feature fully adjustable aisle armrests, which can be lowered fully or left in just about any position. This proved quite comfortable, and also allowed me to easily slide out of my seat when my tray table was extended. Storage on these seats is also adequate, with a sizeable nook beyond shoulder sufficient to place a few water bottles, snack items, headphones or a book. There is also a newspaper, magazine and bookholder underneath the screen. Each storage space includes a headphone jack, USB power cord and universal power outlet. Image by John Harper. Tray tables were large, adjustable and solid. Before Delta started flying A350s around, this was by far the best entertainment setup in the fleet. At over 15-inches, the screens are large and provide very crisp high definition video. Delta’s Studio entertainment system runs seamlessly. Scrolling can be accomplished smoothly by touch or using the remote, which proved useful given the distance between seatback and monitor. The LSTN headphones I had on this flight were a tremendous improvement over the ones I’d used eight months prior. They sounded great, effectively canceled noise, and were comfortable enough that I never wanted to remove them. Great improvement in this department. The LSTN headphones used in Delta One business class have greatly improved since launch. Image by John Harper. To say that the Diamond seats don’t offer direct aisle access is a bit of a misnomer. When fully reclined, my window seat neighbor had to step over my legs to reach the aisle, but he could easily do so without taking more than a slightly larger than normal step. He could access the aisle without my help. That’s all that frankly matters. If I had been asleep, I likely would not have noticed his passage. When the seats are upright or slightly reclined, there is such adequate legroom so that one passenger can walk past effortlessly. Moreover, I felt very private during the flight. With the seating staggered and angled toward the window, it was difficult to observe any other passenger without standing up. I could just barely see over my lefthand neighbor’s shoulder, and that was all. This felt at least as private as the reverse herringbone seating so lauded on the A330, on which I can easily see my across-the-aisle neighbor, as well as whoever is sitting in the next aisle and window over. During the entire duration of the flight, the small cabin was as serene as a private jet. Noone so much as walked past to go to the restroom. Delta’s Boeing 757-200s are some of the oldest jets in the fleet. Some specific planes are approaching 30 years old. Noone would have judged our aircraft to be more than a couple years old based on the interior, though. Unlike United and American, Delta has refitted its 757s with a version of the Boeing Sky Interior used in the 787 Dreamliner and new 737s. The interiors look brand new, and passengers are greeted by the soothing glow of mood lighting as they approach the cabin door for boarding. Unlike the economy cabin, the small Delta One cabin still retained the original, standard hatch-door overhead bins, but everything still felt fresh. Lavatories were standard 757 but well kept. Delta One lavs were stocked with Malin + Goetz soap and lotion. Delta has also installed a version of the touchless toilet actuators found on its latest jets. I was impressed by the dynamic mood lighting used on this flight. I can’t fathom why Delta wouldn’t install this lighting on the 767s it retrofits. It made the whole jet feel like a truly new airplane. The light color shifted subtly throughout the flight to augment the tonality of natural light coming in, and eventually faded to deep indigo for sleep. Internet was provided through the latest Gogo 2KU satellite Wi-Fi, and was adequately fast for everything I needed to do on my laptop. I’ve always advised friends and acquaintances to take the 767 whenever flying Delta transcontinentally. I hereby rescind that recommendation. While the 767’s spacious economy seating is vastly preferable to the 757, the Delta One cabin is better on the latter. The entertainment was better, the cabin atmosphere was better, and the seating itself was comparable at a minimum. I really appreciate what Delta has done with its 757s, and would happily take a seat in this Delta One cabin anywhere the airline flies. 757 — turn left and never see the peasants again until landing!